Combine flours and sea salt in a medium mixing bowl. Combine dry yeast, oil and warm water in a small bowl or measuring cup. Stir several seconds until yeast dissolves. Let rest for 5 minutes. Pour wet ingredients over dry ingredients and mix to form a ball of dough. Knead for 10 minutes by hand or place in a food processor and pulse frequently to form a firm ball of dough, about 4 to 5 minutes. Lightly oil a large mixing bowl and place the dough in it. Cover with a damp cloth, place in a warm area and let rise for approximately 1 1/2 to 2 hours or until the dough doubles in size. Preheat the oven to 400°. 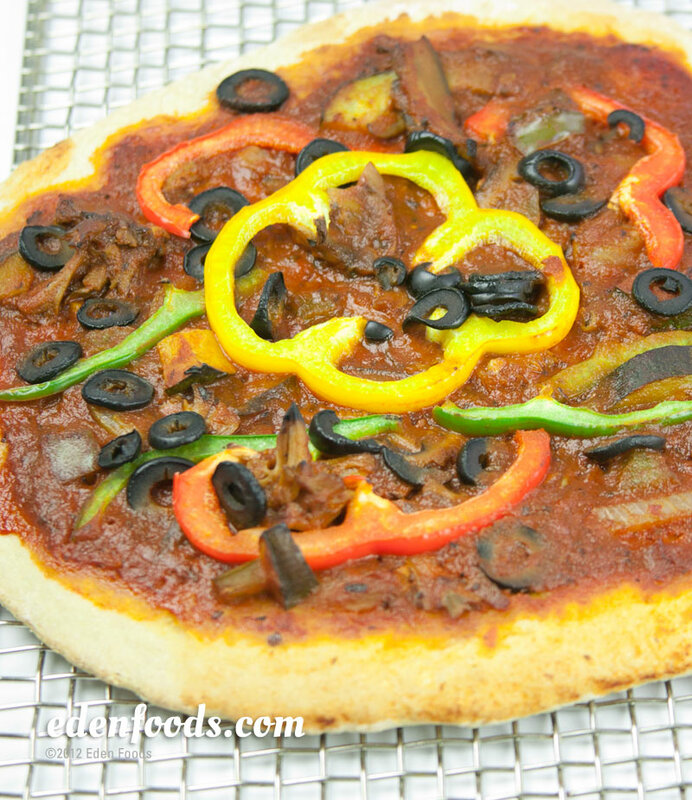 Divide the dough in half and roll out on a floured counter top to form 2 pizza crusts. Place the dough on pizza pans or large cookie sheets and brush each with olive oil. Add equal amounts of Pizza Pasta Sauce, garlic, onions, mushrooms, green and red peppers, and olives. Sprinkle gomasio and basil over each. Allow to rest for 10 minutes. Bake the pizzas for 25 to 30 minutes or until the crust is light brown on the bottom and crispy. Slice each pizza into 8 equal size wedges and serve.